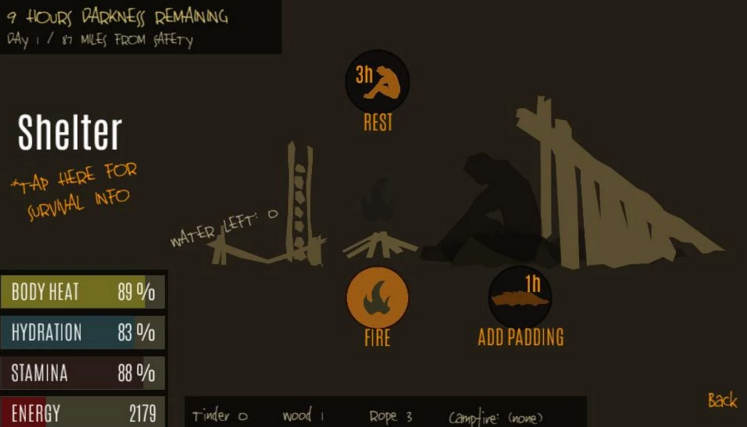 Sand Bay Games’ Survive – Wilderness Survival by Juuso Hietalahti is a solid, enjoyable survival simulator. What stands out about Survive is the difficulty. After your car crashes, it’s up to you to get to safety and rescued. It’s a thin back story for a survival game, but some of the best survival-oriented games such as Lost in Blue on the Nintendo DS ran with a similar narrative (a shipwreck) and it worked. Survive is a game meant to be played in a sitting as there’s no save function and every move should be taken with some planning. You have meters monitoring your body heat, hydration, energy and stamina. If any of those drop to zero your character dies, so difficulty comes is there in the way of a balancing act between keeping your character healthy and actively foraging, building, getting water, and trying to close distance between you and safety. In several plays I haven’t been able to do it. The methods of staying healthy includes making sure you have a source of water, making sure you have food, and making sure you have crafting supplies for tools, shelter, campfires, etc. 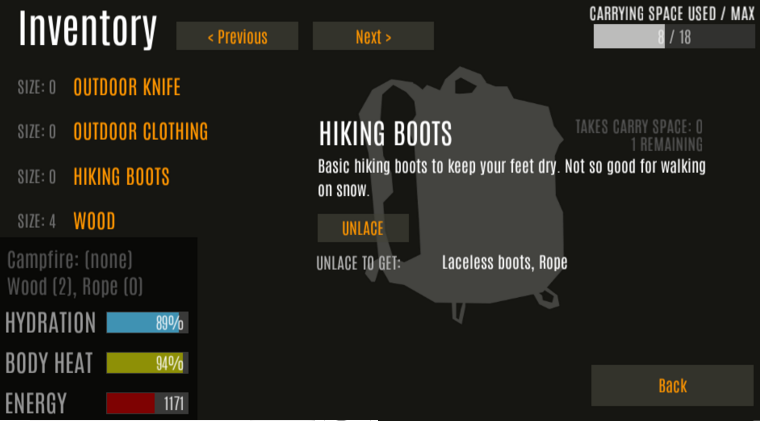 You’ll definitely want to make sure you have fire and shelter as there are weather conditions in this game. When traveling the path you take can determine how close you are to safety and will have a toll on your health as stamina, energy, and hydration will drop since time lapses in the game. Everything results in a time lapse: making tools, traveling, foraging—everything. 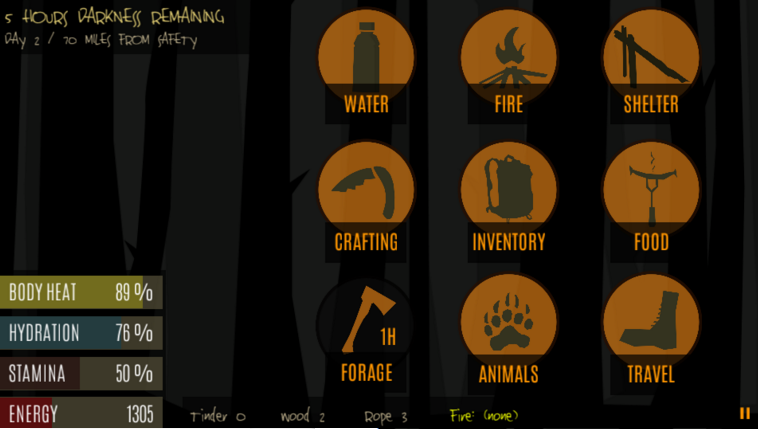 I like this rush of wilderness survival games. Not sure how enduring it will be, the pure wilderness ones, but they’re fun for now.